Life with Lucy, David and Vivian: 2 Must Haves . 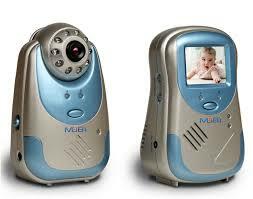 . .
1) Mobicam: It's a monitor that allows you to see and hear your baby. It has been worth the investment so far just for the entertainment of watching how Lucy falls asleep (she's a mover). Seriously though, the idea of being able to see my babies and know that they are ok is priceless. Also, both the camera and monitor are portable. I'd reccomend buying it from Amazon. 2) Mother's Touch Comfort Bath Sling: Having to fill up a baby bath tub, finding room to store it inbetween washings and finding a place to wash the baby was so annoying to me so we used the bath sponges for Lucy. This little item has all the conviences of the sponge AND it also sits up if you want it to and it will last far longer. It stores easily on a hook in our shower. I LOVE it (and so does David).